Americans drink a lot of tea each year and, while coffee might get more press, it is just as important to have a great cup of tea as it to have a great cup of coffee! Each year, we drink approximately 3.6 billion gallons of tea (compared to more than 10 billion gallons of coffee) and more than 80% of that is black tea. There are plenty of boutiques that will supply you with premium teas, but most of our tea is the more budget-friendly variety and is found in the grocery store coffee and tea aisle. In a recent issue of Cook’s Country magazine (April/May 2016), the test kitchen set out to review dozens of black teas to find out which supermarket black tea was worth brewing. The test kitchen tasted teas both black and with sugar and milk. They evaluated the teas for flavor, complexity, astringency and overall tastiness. They were surprised to find that many of the teas that performed well when brewed black, scored poorly when milk and sugar were added to them – and vice versa. A laboratory evaluation of the teas revealed that those with higher tannin contents tended to do better when served with milk, which smoothed out those tannins without making the tea taste flat, as the milk did when added to low-tannin tea. The result of all this testing was that the kitchen was forced to divide their teas into two categories based on how you take your tea. 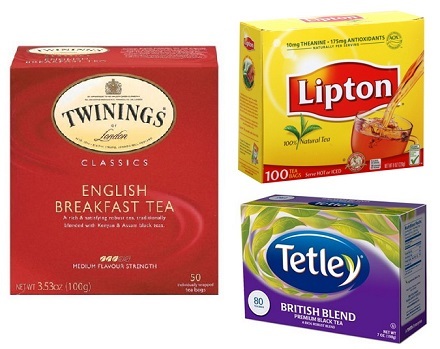 If you take your tea plain: Four teas were recommended by the tasting panel: Twinings English Breakfast Tea, Lipton Black Tea, Bigelow English Teatime and Stash English Breakfast. The Twinings tea was the overall winner with a “mellow,” “well-balanced” flavor profile that was straightforward and clean. Lipton took second place, with “toasted” flavors that the tasters liked and mild tannins. If you take milk and sugar: Two teas were recommended: Tetley British Blend and Celestial Seasonings English Breakfast Estate Tea. The Tetley had a boldness that worked well with milk and sugar, as well as a hint of smokey caramel. The Celestial Seasonings was not a favorite when tasted plain, but had the “appropriate tannins” to pair with sweeteners.